I spent 40 years of my life worrying about weight, yo-yo dieting and hating the size of my body. Somehow I changed my life and mindset and I lost weight. I wanted a business that specialised in helping women who have the same struggles that I had with weight loss. I’d qualified as a hypnotherapist which had opened my eyes to the importance of mindset when it comes to weight loss. Unfortunately it didn’t have all the answers that I needed to get lasting results for my clients. My coaching is now the most important strategy I have in my toolkit! I enjoy helping women to redefine not just their relationship with food and body, but with their family, their partners and of course themselves! I love hearing about the unexpected benefits that they gain too, such as a new job or being able to bend over and tie up their own shoelaces. Being told that you’ve saved someone’s marriage or saved someone’s life is priceless. I have two programs that help women with the right mindset, knowledge, and strategies to change their approach to weight loss. I love helping my ladies choose to be ‘Dietproof’ – no more negative mindset, counting, weighing, and obsessing about food. I support those challenged with unwanted eating behaviours such as emotional eating and binge eating. I’ve been working with my clients face to face whilst I build my practice. I am now creating Enlitened Eating as a day workshop to offer to groups. This will be a great way of attracting new coaching clients, too. The Training is brilliant! It doesn’t just teach you how to look after your clients but how to look after yourself as a coach, which can only be better for you clients. It gives you step-by-step strategies that you can follow to get you going and the confidence to follow your gut feelings when you need to step out of the box. The education you receive gives you the confidence to support clients as individuals; it simply meets their needs. passion, and heart! Learning from someone who has made this their life’s purpose is truly inspiring. The Facebook group was brilliant and I am still in touch with many of them. I have created a brand new business that I am deeply passionate about and committed to. It helps me to stand apart as I believe that this is a unique offering. I am now an expert in this field and that gives me the confidence I need working with clients or standing up in a business networking event to promote my services. Financially it has been a huge investment, it isn’t just the Training but everything else that comes with being a business owner. Having a mentor has helped me to improve my services and my pricing. I’ve been qualified for a year and it is now that the financial gain is starting. community. This work is extremely important and it needs to be heard. Even if I hadn’t gone on to create a business I would still value this Training because of the personal value it has given me. To create health communities where I have a team of health professionals that fill the gaps that the other doesn’t offer. Ideally offering weekend events of talks and workshops where people can access the support that they need with mind, body and health. To provide an environment that creates positive beliefs! 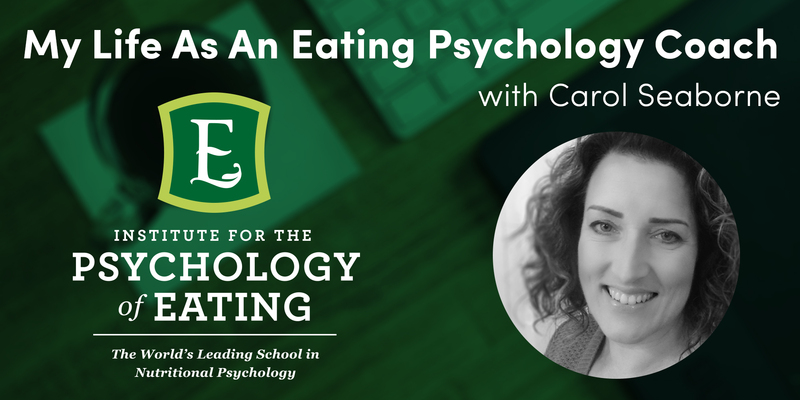 I love saying I am an Eating Psychology Coach because people don’t know what it is. There is no preconception. They want to know all about it and are so curious. I am proud to be one and strive to live up to what I have learnt. So each day is an experiment and a few more baby steps forward. BIO: Alongside Carol’s Eating Psychology Coaching, she is a Control Practitioner and Hypnotherapist, which gives her an amazing set of tools to facilitate change for the women she supports! She believes in practising what she preaches by focussing on a nourishing relationship not just with food but with life she leads!